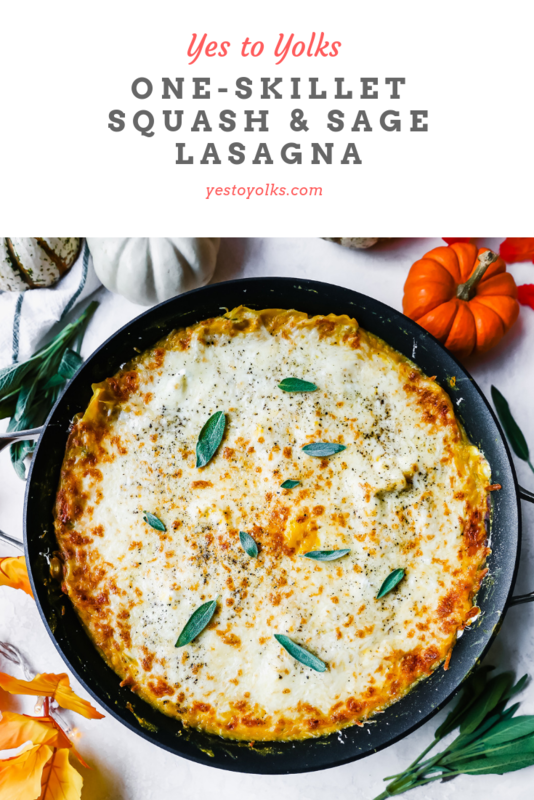 I know the last thing we all need is another recipe for lasagna. 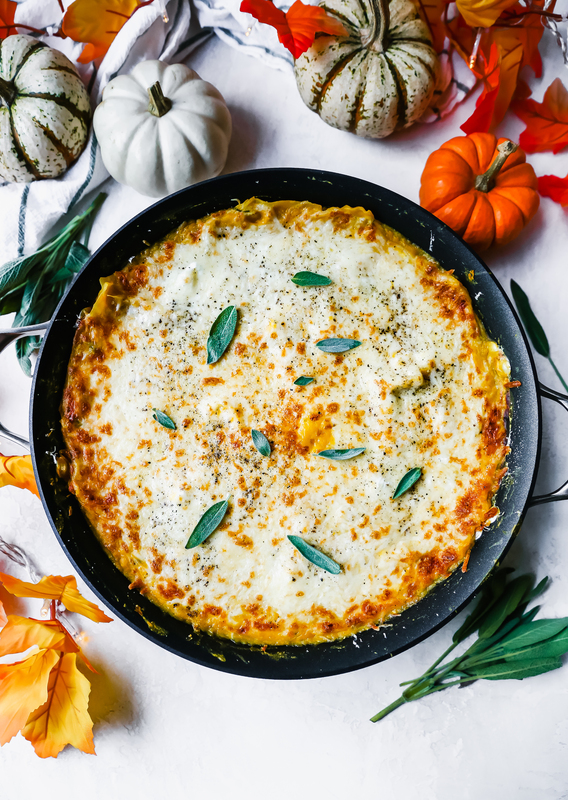 A quick Google search will inundate your brain with lasagna options. Plus, I think a lot of people have tried-and-true family recipes for lasagna. I find that it can be a very polarizing dish, as people feel very strongly about what is “traditional” and how it should be done. Well, today, I’m giving you a very UNTRADITIONAL version that takes 30 minutes to make and only dirties one pan. That is a heck of a lot easier than most lasagna recipes! Call it my modern-day, weeknight-friendly version. The star ingredients? Butternut squash (but you can use any type here!) and warm, spicy sage. Two of my absolute favorite (and most used!) ingredients this time of year. 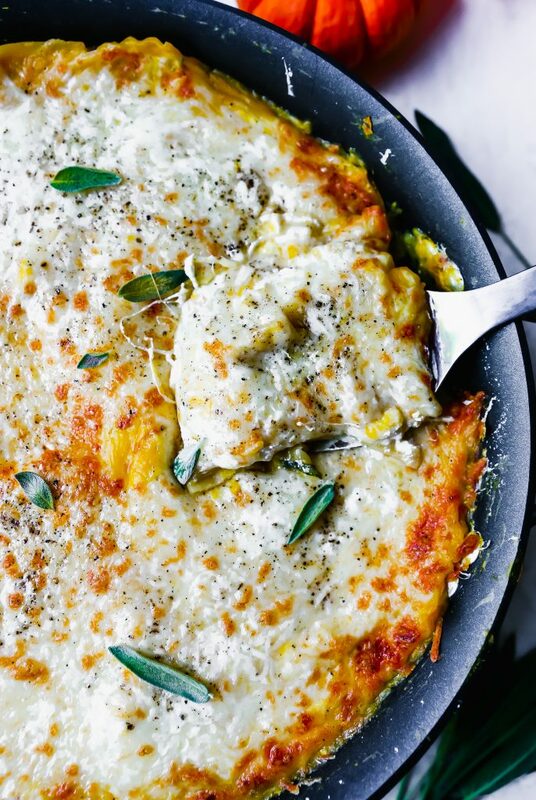 I love the butternut here because it lends such a silky texture to the dish, similar to that of a traditional béchamel used in many lasagna recipes. It’s also slightly sweet! Which compliments everything else so nicely. It balances out the savory, for sure. 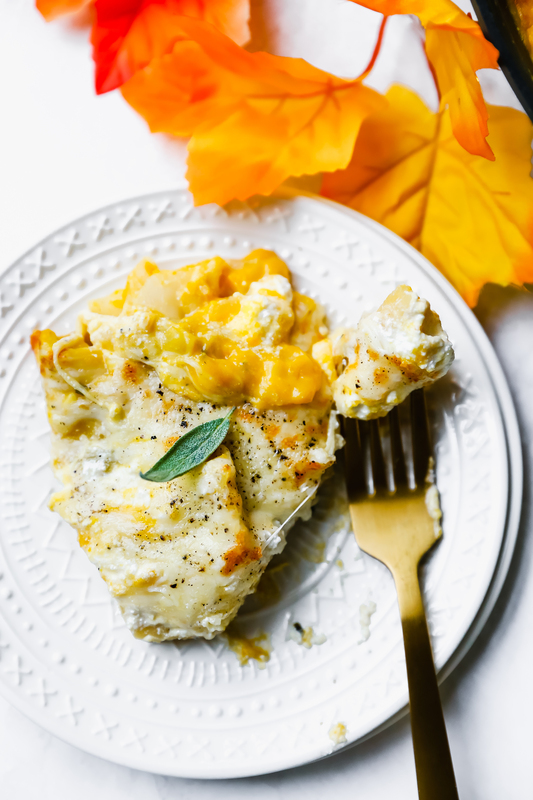 I used a can of butternut squash puree for this recipe, but I’ve included instructions for making your own in the recipe below. 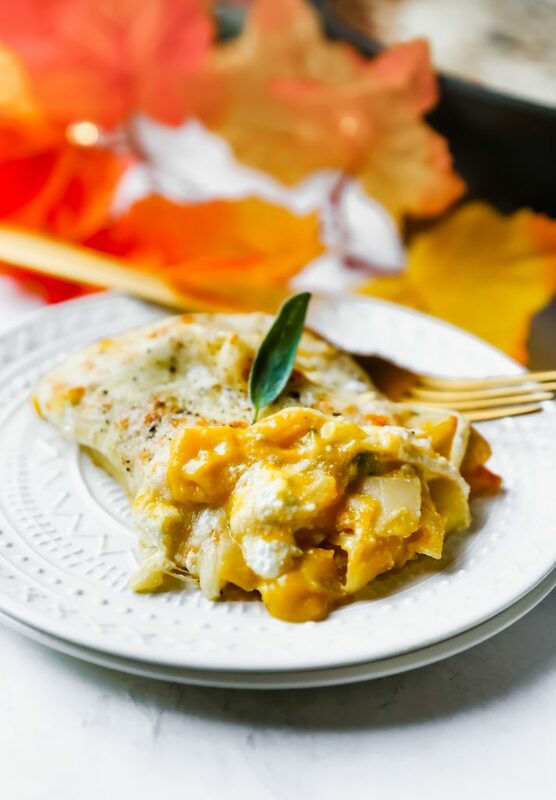 I use butternut puree in all sorts of things (these raviolis are a running favorite use), and I know that making your own may sound daunting, but it’s super easy. If you don’t feel up to it (or if you want to preserve the “one-pan” nature of this dish), buy a can at the store! Canned pumpkin works too! I like the flavor the squash with onion, garlic, some spices, and loooots of fresh sage. Give it tons of flavor and warmth! 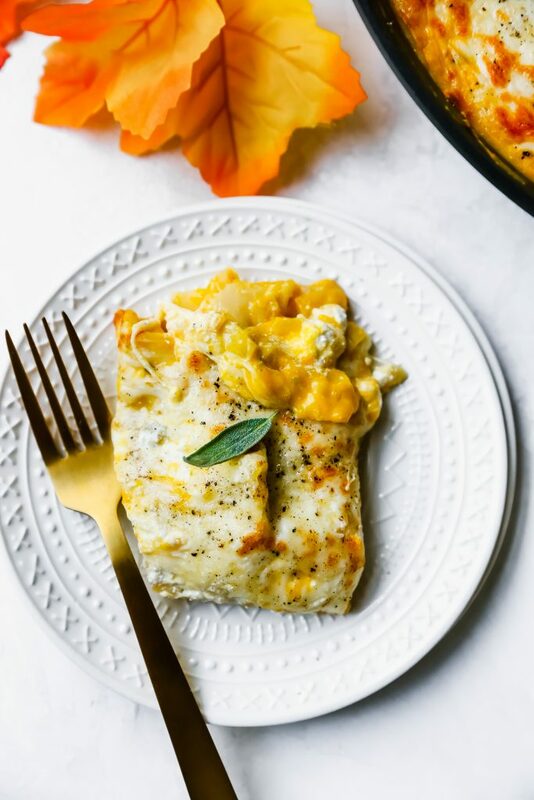 Layered up with lasagna noodles, globs of soft ricotta, and melty mozzarella cheese, you’ve got a real winner here, people. It’s seriously swoon worthy. This recipe comes together so quickly and easily. Whenever I develop recipes like this, I’m almost in disbelief that something cooked so quickly and simply can be so delicious and satisfying. You’re only 30 minutes away from an insanely comforting dinner! Especially in this season of life. I am pregnant, which translates to “I am always tired.” Especially come dinner time in the evenings. Dan and Kieran are lucky that I haven’t resorted to take out most nights of the week at this point. I also have a small child who seems to have endless energy. With that comes my mom guilt, making me feel bad spending extraneous time in the kitchen that could be spent with him (I seriously don’t want to miss a minute!). Plus, I work a job. And have a household to maintain (the laundry pile is never-ending!). Just like most average people! In addition to all of that, I also get extra lazy this time of year when it comes to dinner. I think it’s because I’m usually cold, the sun has already started to set come 5 pm, and all I want to do is curl up on the couch with a huge blanket and some slippers. Life, unfortunately, doesn’t work that way for most of us, so easy and fast dinners like this one make me oh so happy. And I think it will make you and your family happy too. 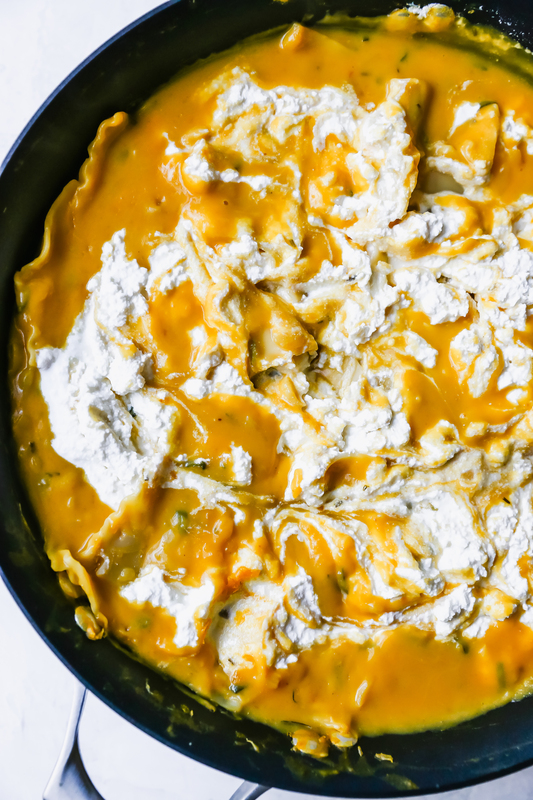 Step away from tradition and embrace this modern (read: MUCH EASIER) take on lasagna. I promise you’ll like it. Heat the oil in a large skillet over medium-high heat. Add the onion and cook for a few minutes or until it is softened and translucent. Add the garlic and sage and cook for another minute. Add the squash/pumpkin and spices and stir to combine. Slowly whisk in the milk and broth. Season, to taste, with salt and pepper. Bring the mixture to a simmer. 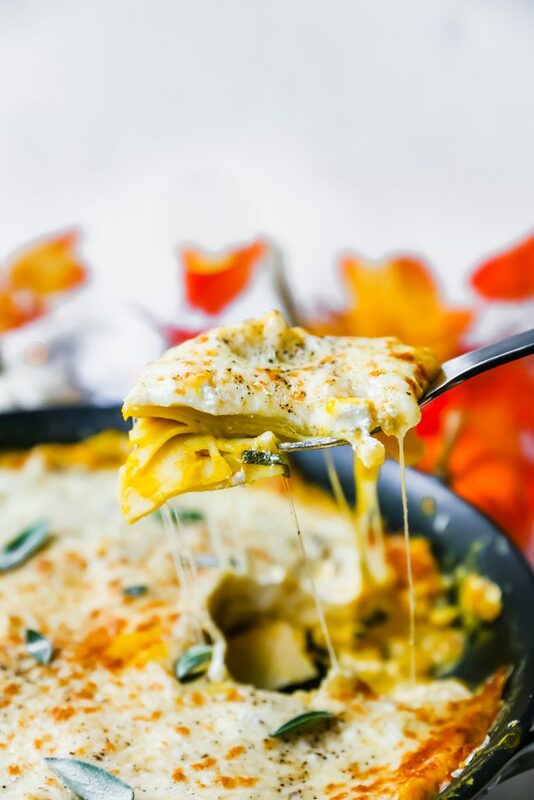 Break the lasagna noodles into 2-inch pieces and add them to the skillet. Reduce the heat to medium-low and simmer, stirring occasionally, or until the noodles are tender and the sauce has thickened, about 15-20 minutes. Dollop the ricotta cheese all over the surface, stirring it into the sauce in a few places (not all the way, though! You want larger dollops of the ricotta throughout). 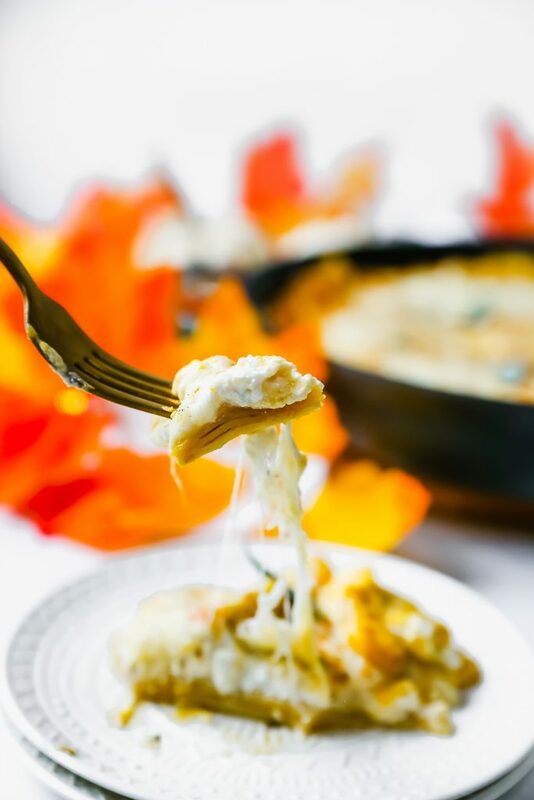 Sprinkle the mozzarella and parmesan cheeses evenly over the top and cover the pan so that the cheese can start to melt. Place the skillet, uncovered, in the oven and broil for 1-2 minutes or until the cheese is gooey, melted, and golden brown in spots. Garnish with additional sage and serve. If you cannot find canned squash puree, feel free to sub with a can of pumpkin puree, OR make your own. To make your own, roast 2 cups of cubed/peeled/seeded butternut squash with a drizzle of olive oil and pinch of salt in a 375°F oven for 25-30 minutes or until soft and caramelized in spots. Puree the squash until smooth in your food processor. Follow the lasagna recipe above, subbing the canned puree with the homemade.